Looking to decorate your bright and modern home or office space with some succulent planters? This set of 2 hexagonal white ceramic planters would be perfect for any table, desk, counter, or window sill. They are inspired by Scandinavian minimalist design, and spiced up with bamboo bases for some Oriental flair! Your Satisfaction Guaranteed: Should the item arrive damaged from transit, contact us and we will take care of you. All of our reviews are verified reviews, by unbiased real Amazon customers. ORDER NOW by Clicking the Yellow "Add to Cart" Button Above and Get Your Home Decoration Project Started at a Great Price. ★ QUALITY & VALUE: High quality nursery pots for your succulents, with the best value for price among ceramic planters of this size (4''). ★ MINIMALIST DESIGN: Hexagonal shape in plain white for a touch of Scandinavian-inspired minimalism, coupled with a bamboo saucer for some Oriental flair. 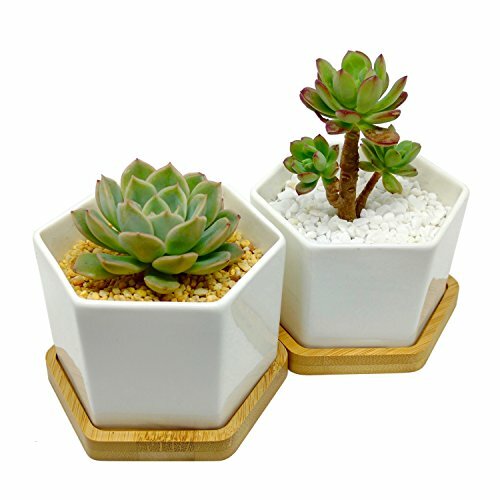 ★ PERFECT SIZE: Dimensions are approximately 4'' W x 2.6'' H (without bamboo tray), perfect for a medium/large succulent. Not TINY like most of the other ones on Amazon. ★ CREATIVE D.I.Y. FUN: Be your own interior designer! Decorate your home or office space with these beautiful planters, or gift them! If you have any questions about this product by Espoir Living, contact us by completing and submitting the form below. If you are looking for a specif part number, please include it with your message.